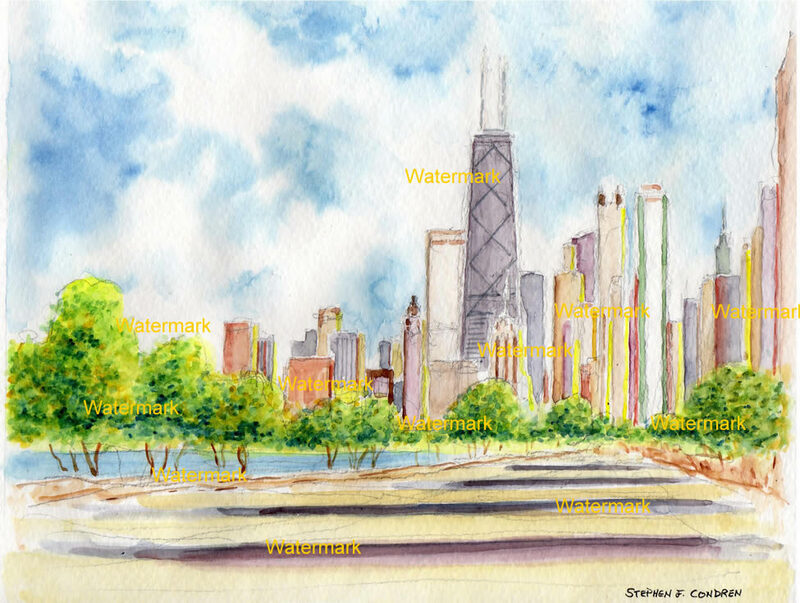 This is an article on Chicago skyline watercolors and prints, which is for sale at discount with prints by artist Stephen F. Condren, BFA-SAIC, of Condren Galleries, a Fine Arts Gallery, offering JPEG & PDF scans. Watercolor are a wonderful medium to do skylines with. The greatest quality of watercolors are their ability to carry pigment through water giving a transparent effect. This effect makes it easy to introduce pen & ink and pencil lines to the a work of art. In the case of skyline painting this is especially true due to the architectural nature of the subject. Buildings require delineation and thus watercolor permit this access of lines. In general, the scale of most watercolor, no matter what genre are small. This is because you are working with fine lines and providing a lot of detail in a small about of space. Imagine, if you will, having the Sistine Chapel executed in watercolors with the same detailed. You would not be able to see anything, it would all look like a blur. This is where perspective comes into play, due to the fine detail you have to accommodate the space of the viewer. Providing watercolors in a scale that can be handles or easily looked is the best code of practice. As with all works of art, light is crucial. One of the most important elements of watercolor painting is freshness. When you put the brush to the paper you have to work it the way that you want and quickly. If you do not, then the work of art becomes murky and looks worked or over tooled, something to be avoided at all costs.